Dutch cellist Pieter Wispelwey has attracted a loyal following in Quebec over the last two years through appearances at the Lanaudière Festival and the Ladies' Morning Musical Club. The 34-year-old's playing is a model of intensity and integrity, eschewing all superficial display and cheap effect. Wispelwey will be playing twice in Montreal in December, with the Orchestre Métropolitain and again with the Ladies Morning Muscial Club. Last week he spoke to La Scena Musicale from England, where he is assisting the post-production editing of his recent Channel Classics recording of Schumann's Cello Concerto (scheduled for release in January 1998). SM: Can you tell us about your new recording? PW: I recorded this Schumann concerto about three weeks ago in Holland with the Australian Chamber Orchestra and the Netherlands Wind Ensemble. The interesting aspect of this recording is that we did not have a conductor, yet I think the orchestra is more together in my recording than in any other Schumann cello concerto I've heard. SM: Do you always edit your own recordings? PW: I've been involved in editing my last four recordings because no one else knows exactly the result I want. I make hundreds of interpretive decisions and the engineers punch them in. SM: Cellist Christoph Coin and Philippe Herreweghe just released a period-instrument recording of the Schumann Cello Concerto on harmonia mundi. How will your recording differ? PW: The Australian Chamber Orchestra, which is about the same size as the Orchestre des Champs-Elysées, occasionally plays on period instruments, but for this recording gut strings would have been too expensive and impractical. Though we use modern instruments, I think our recording is overall more authentic and transparent sounding than harmonia mundi's. Coin's playing is very larmoyant, quite old-fashioned. It takes us back to the style of the 1920s and 1930s, not back to the 19th century. He uses lots of nervous vibrato. I prefer a purer sound with little or no vibrato. SM: You just won a Diapason d'Or award for the Poulenc and Chopin sonata disc (Channel Classics CCS 10797). What effect does that have? PW: Awards are very gratifying. Commercially, the best thing is to get all the awards for one recording. Of course these awards are somewhat arbitrary: the Chopin/Poulenc won a Diapason d'Or but in Repertoire magazine it was criticized. SM: You've been looking for a permanent cello to call your own. What are you playing now? PW: At this very moment somewhere over the South Atlantic there is a cello flying to me. It will land in Rome and I'll pick it up there after my Montreal performances. I can't tell you any more about it except that it is a Contino cello, quite rare and valuable. I can't afford to buy it myself but it belongs to an organisation that will loan it to me if I can find a sponsor. In Montreal I'll use my normal French anonymous cello, which I love. SM: You once described playing cello with an orchestra as "combat". PW: Yes, concertos are often written so that the cellist has to struggle against the orchestra like a tormented hero. The audience derives pleasure from watching the physical entertainment. Nowadays there is so little time to rehearse that the soloist ends up struggling against the conductor. Really, it is just a lucky break when the performance turns out well. SM: So you prefer solo recitals? PW: Artistically, solo performances are more satisfying, but playing with large ensembles is chaotic and exciting. I enjoy combative situations, to survive in difficult circumstances and still get a musical message across. SM: What about your style and influences? PW: Stylistically, lyricism is important. The instrument should approach the expressivity of the voice. I was influenced not only by the early-music movement but also by Dietrich Fischer-Dieskau, who taught me that one can be dramatic and expressive without sounding tormented or heavy. I really dislike heavy playing, dragging the tempo just to make a point. 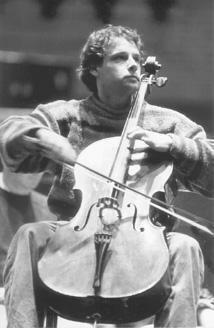 I like Steven Isserlis's cello playing. I love Yo-Yo Ma, his honesty ‹ but not his interpretations! SM: Any new recording projects? PW: Next month I'll be recording the Bach suites for the second time. I expect the new recording to be livelier, freer and more expressive since I am now more experienced and less intimidated by the microphone. Next year I'll record the Lutoslawski and Dutilleux concertos. SM: You don't play in the United States much. PW: There are prospects for engagements with the Boston Symphony and the Chicago Symphony, but the USA is a strange country. They prefer superstars and child prodigies, either the very young or extremely old. I find this silly. I feel much more at home and welcome in Australia, South America and Canada. Pieter Wispelwey plays the Schumann Cello Concerto with the Orchestre Métropolitain on 2 December at Place des Arts and on 4 and 5 December on tour. On December 7 at 3:30 Wispelwey and his duo partner Paolo Giacometti play Debussy, Franck, Hindemith, Poulenc and Webern at Pollack Hall for the 932-6796 Ladies' Morning Musical Club.